Traceability helps to identify the way a given requirement or process has been implemented in a system, enabling you to follow the path of dependencies from the initial request, through a modeled solution and up to the deployed physical system or process. The Audit View can be tailored to display specific types of change, and to filter changes by time period or user. Enterprise Architect's built-in Gap Analysis Matrix helps you to model gaps between your as-is and to-be architectures. 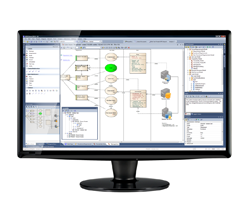 The matrix provides a convenient interface for defining and monitoring identified gaps elements, which can be traced to other elements in the enterprise model. The Relationship Matrix helps you to study the relationships between model elements in a tabular view. Use it to easily identify traceability gaps and to conveniently create, modify or delete relationships. Document which relationships form CRUD operations using textual overlays, or customize the matrix overlays to suit your particular modeling domain. The Traceability Window provides a dynamic, navigable view of the current element's relationships to other elements in the model. Relationships shown include Aggregation, Inheritance and Dependency; embedded elements are also shown. By highlighting interconnections between levels of abstraction in the model, the Traceability Window provides a powerful impact analysis tool helping you to see the effect of changing requirements on downstream elements. The powerful Model Search facility retrieves each element in the model that meets the versatile criteria you define. The elements listed in the search results are selectable for printing, reporting, editing, adding to documentation and inserting into Team Review topics. 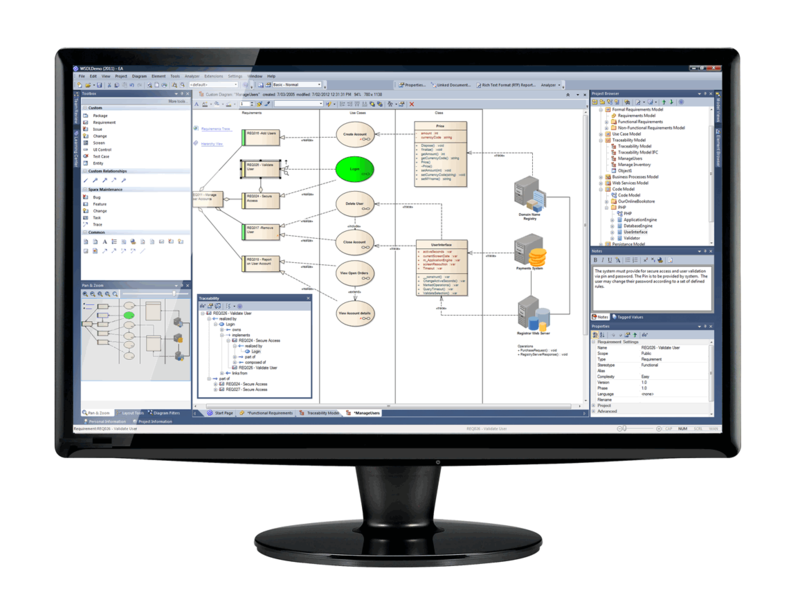 Enterprise Architect's Model Views window provides a dynamic, filtered view of elements from the underlying model hierarchy. You can organize elements according to search criteria, favorite elements and diagrams, or technology-specific information, such as elements belonging to a particular framework view point. Views can be stored locally for use by individuals or included in a shared repository to achieve collaborative views. Automatic notifications can be set for a given Model View to alert you when an element created by another author is added to the view. The Element Browser provides a context-sensitive view of all meta-data related to the selected element. This allows you to trace information on testing, project management, structured scenarios, maintenance and model semantics. The Element Browser thus provides a central hub for dynamic model reviews and a launchpad for related actions. The Package Browser is a tabular, editable view of elements use it to streamline the process of creating and updating elements in a given package. This can be particularly useful for analysts to edit formal requirement definitions within the model. You can also print the list or generate an RTF document directly from the entries in the Package Browser. Enterprise Architect makes it easy to track and display the use of an element. The 'Find' and 'Usage' features for Enterprise Architect's diagrams, Project Browser and Package Browser show all occurrences of a given element throughout the model, and enables you to easily navigate to any occurrence. Enterprise Architect can automatically populate a diagram with all elements that relate to a given element. You can filter the inserted elements based on the type, direction and depth of the relationship. The 'Insert Related Element' feature provides a fast and powerful way to build up specific relationship overviews for your frameworks or reverse engineered source code. Enterprise Architect supports a variety of useful out-of-the-box reports including: Resource and Task Details, Project Issues, Project Glossary, Project (size) Statistics, Dependency and Implementation Details and Testing Details.